I love curry dishes. But..... I think I love naan bread more. Eating curry is sort of an excuse to eat naan. Mmmm. 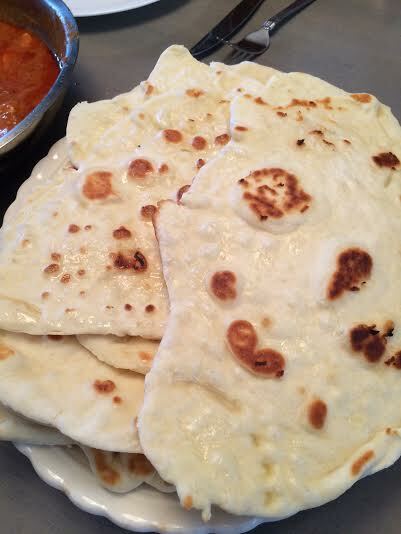 The problem is, nothing really beats a warm, chewy, delicious chunk of naan bread from an Indian restaurant. Sure, you can buy it from a package at the store, cringe a little bit that the "best before" date is often more than two weeks into the future, and pretend it tastes sort of like it should. But....It just doesn't. I didn't realize how easy naan bread actually is to make from scratch. I WISH I had before now. I tried making some from scratch this past weekend, and I don't think I'll ever buy it again. The kids even ate this up like crazy! The first few pieces didn't exactly turn out as pretty as I would have liked, but I quickly solved that with rolling it thinner. I'm going to link to the the ORIGINAL recipe here, but I've re-written it in my own words, below to reflect what I did. *double zero flour can be found in some supermarkets, and almost always at specialty Italian stores. All-purpose flour can be substituted, but I think using double zero really helped the chewy texture. Place milk, yeast, and sugar in the mixing bowl of a stand mixer. Allow to sit until yeast is foamy. Beat in sour cream, egg, canola oil, and salt. Change to dough-hook attachment and mix in 1 cup of flour, and baking powder. With mixer on the lowest setting, gradually knead in the remaining flour, 1/2 a cup at a time, until a soft dough forms. Allow the dough-hook to knead the dough for about 5 minutes, until smooth and elastic. Add additional flour, a few tablespoons at a time, if the dough is too sticky. Place in a greased bowl, cover, and allow to rise in a warm place until double in size, about 45 minutes. The original recipe requested all of the ingredients be placed in a bread machine and to use the dough setting. After the dough has risen, punch down. Divide into 8 equal sized balls, cover, and allow to rest while preparing pans and butter/garlic mixture. The original recipe calls for the dough to be divided into 6 portions, but I found this to be slightly too big. While dough is resting, mix together melted butter and garlic and set aside. Preheat a large, heavy frying pan (I used a 16 inch pan), and season with about a tsp of canola oil. I had mine almost smoking hot. I figured that since traditional naan is cooked in a tandoor oven, the pan should be as hot as possible. Roll out dough as thin as you can. The original recipe calls for 1/4 inch ovals, but I found that was too thick. Basically, I rolled it as thin as I could on a lightly floured surface, so that I could still peel it off without ripping. Lay into the hot pan, and allow to cook until it starts to create large air bubbles/blisters on top (mine took less than 2 minutes. Use a pastry brush to lightly coat with the garlic butter mixture, flip, and allow to cook another minute (until browned). Place on an oven safe platter in a warm oven and repeat with each piece of dough. Next time, I think I'm going to finely chop some cilantro and mix it in with the garlic butter. This is a wonderful base recipe that will be fun to tweak going forward.